You'll be £28.00 closer to your next £10.00 credit when you purchase British Warships of the Second World War. What's this? 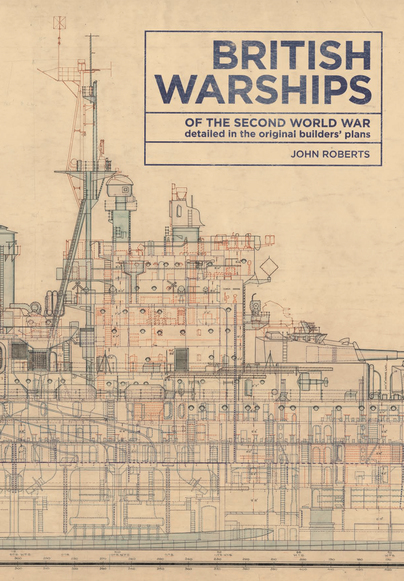 This is a wonderful book to look at, and the standard of the writing is exemplary; it is highly recommended to anyone with an interest in the conventions and execution of warship plans. The standard of publishing is faultless, with double page spreads and even a four page gatefold of the Ark Royal. The drawings are a work of art in their own right and this book is a marvellous tribute to the skill of the draughtsmen. Clearly this book will be of particular appeal to the modeller and those with a need for detailed technical information for their research. A well produced and substantial collection which is an invaluable reference work containing John Roberts' expertise of the ships of this era. The standard of publishing is faultless, with double page spreads and even a four page gate-fold of the Ark Royal. The drawings are a work of art in their own right and this book is a marvelous tribute to the skill of the draftsmen. Clearly this book will be of particular appeal to the modeler and those with a need for detailed technical information for their research. There is a wealth of material in this book which will make a fascinating study for anyone interested in the warships operated by the Commonwealth navies during the Second World War and their design processes and it can be read from cover to cover, dipped into from time to time or used as reference work by those who cannot, easily, gain access to the original drawings. I heartily recommend it to anyone with an interest in British warship design and construction during this fascinating period. This is a large scale Volume, about 25 x 20 cm and with some real weight. Over it's 180 pages the book covers a broad range of vessels from the Royal Navy in WWII, with everything from Capital Ships, to Auxiliary AA Ships. The Illustrations are drawn from original plans held at the National Maritime Museum in Greenwich, and as such are highly detailed. However, their size sometimes makes them of limited use. These were very large scale plans when drawn and the original drawing would have been considerably larger and thus the detail is rather small. This coupled with the fact they have yellowed with age somewhat makes them perhaps not as useful to the scale modeller as they might be. For many of the ships, several drawings are provided, including deck sections and rigging diagrams on occasion. However we d note get a full suite of drawings for any given ship. Also we do not get many ships per section. For instance we get 4 Battleships (Nelson, King George V, Warspite, Renown), 6 Cruisers (Kent, Ajax, Leander, Manchester, Naiad and Cairo) and only one Aphibious Warfare Ship (Bruiser) and one Depot Ship (Adamant). These niggles aside, this is a beautifully presented book with great sections accompanying the plans that give background and context to each ship and class. It also has to be said that a book covering more ships and classes or full suites of plans of each ship would have a good few thousand pages. So what we have here is an extremely well presented and attractive book with some great information to form the basis of research for the dedicated modeller or just a good book those less interested in utilising the plans will enjoy on it's own terms. Recommended!